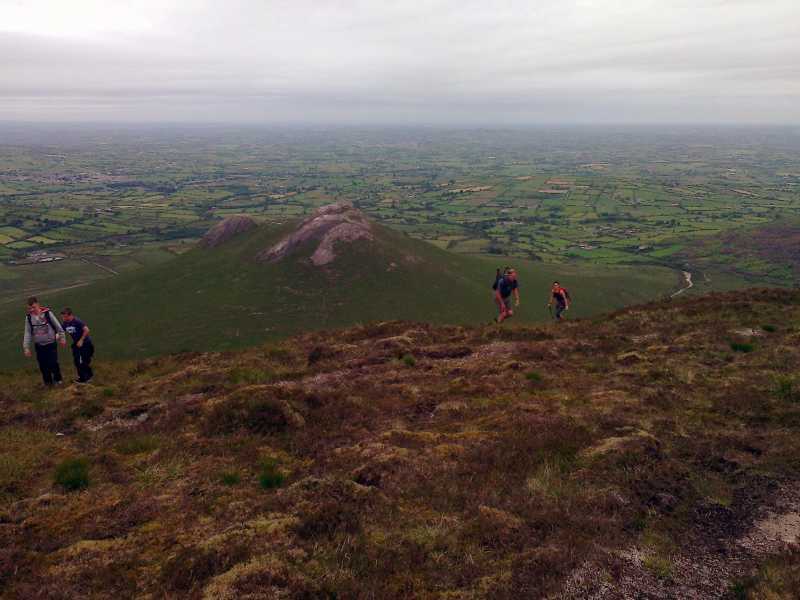 We made our guest appearances at the Mournes Walking Festival on Saturday. The Saturday big walk, the Saturday big eat, the Saturday big drink and the Sunday big hangover. The Mourne International Festival seemed to be pretty well run, a good check in check out system, The Wee Binns Club playing a big part in walk leadership. We had its inimitable Challenge Leader Des McConville at the front of the ship - and none better. Details for and against seemed to balance out but where it fell down was in its immediate apres walk. All the big southern festivals feature serious cake eating and socialising after the walk - walkers network, we catch up on stories, plans, etc, flag up events blahdeblah, before we go into the pub next door and lose our faculties. Mournes Festival - nothing. Sign in, here's your free hat, go away. Not so good. Sandwiches, coffee? Not a whisper. But still the same registration fee. T B Discussed I think. ... and so to the mountainviews website and its place in our hearts :-) does it have one? The Dark Lord Jackill kicked off the Scavenger Walks as a way of getting mviewers together, a format that has had its successes. Long standing member of the site and myself, after the Mournes Festival Walk, railed against this and that about the mountainviews site, but were aware that we and the rest of our bold band would never have met had it not been for mountainviews. Is there something else here TBD?